Soon after Pearl Harbor was bombed on December 7, 1941, leaders of the University of Hawaii Reserve Officers’ Training Corps (ROTC) assembled their student members and ordered them to report for combat duty at the Manoa campus. Among the respondents were about 150 students of Japanese American heritage who, two months later, would form the Varsity Victory Volunteers (VVV, also referred to as the “Triple-V”). But first, they would go through some stressful experiences. Ralph Yempuku worked for the university’s athletic department and was leading a visiting football team from Willamette, Oregon, on a tour of the island of Oahu. A bit older than the undergraduates, he would serve as civilian superintendent of the VVV when it became a volunteer labor battalion attached to the U.S. Army Corps of Engineers at Schofield Barracks. On that Sunday morning in December, he drove several military personnel towards the badly burning Pearl Harbor. He was scared, partly because there were so many ambulances and trucks carrying the dead and wounded to hospitals in Honolulu. Back on campus, the ROTC students were issued old Springfield rifles and a single clip of five shells. There had been rumors that Japanese paratroopers had landed on St. Louis Heights, a range of hills overlooking the university’s campus in Manoa, and the ROTC students were ordered to engage this enemy. Many of the students had never fired a weapon before; the closest they had gotten to combat was seeing it on a movie theater screen. Terrified, they took their rifles and trudged up the hill. Fortunately, the rumors were simply rumors. 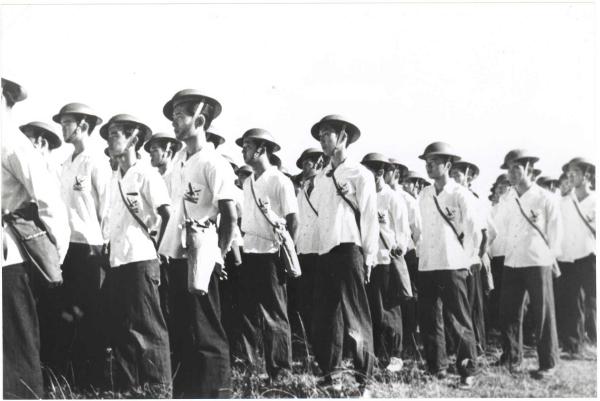 When they returned from the hills, the students formed the core of the Hawaii Territorial Guard (HTG), which was assigned to guard hospitals, power plants, food storage centers and other important sites because the regular Army and National Guard units had been sent to defend the beaches against possible invasion by Japanese forces. The situation was so chaotic and desperate that no one seriously questioned the presence of so many Japanese Americans with weapons in the National Guard or in the HTG. Soon, however, old patterns of racial prejudice and fear would emerge. These old patterns had a long history in Hawaii and the nation, indeed beginning soon after the Japanese started immigrating to America in the late 19th century. Prejudice and discrimination came in the form of housing segregation, educational restrictions, labor issues and, finally, an end to emigration from Japan and denial of the right to naturalize as American citizens. The situation was especially severe on the West Coast of the continental United States where there were just enough Japanese, including immigrants and their American-born citizen children, to provoke violence and White House orders to evict 120,000 Japanese Americans from their homes and communities after Japan’s attack on Pearl Harbor and other military installations in Hawaii. The Army would then imprison them within barbed wire fences in a wide variety of forced detention camps. Some of them were not released until early 1946, months after Japan’s surrender in August 1945. 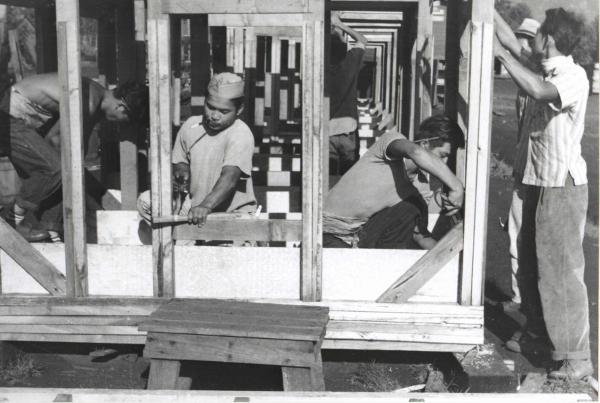 In Hawaii, the vast majority of the nearly 160,000 residents of Japanese descent were placed under severe restrictions, but remained free from imprisonment. America’s leaders succumbed to racist pressures in early 1942 and removed Japanese Americans from the Hawaii Territorial Guard. On January 21, the HTG was assembled just before going to the rifle range for target practice. The group was informed then that the unit was being dissolved. Then, the very next day, it was reformed — this time without any Japanese Americans. Not everyone felt the same way: Edward Nakamura, who would later become a Hawaii Supreme Court justice, thought the action was unjust and a blow to his pride, but he wasn’t “bitter.” Yugo Okubo wasn’t all that disappointed; it just meant that he had to go back to his dreaded science and engineering classes at the university. Emmons accepted the petition and the group of 155 students became the Corps of Engineers Auxiliary — commonly known as the Varsity Victory Volunteers — working for nearly a year on a variety of jobs involving heavy labor at Schofield Barracks. In time, the group grew to 169 young men, including some prominent amateur boxers who were recruited off the streets of Honolulu. When they left campus on February 25, 1942, for their new lives as Army volunteer workers, they had no idea that it would be nearly a year before the U.S. War Department would change their classification of 4-C, the designation for “enemy aliens,” thus preventing any Japanese American from serving in the military.